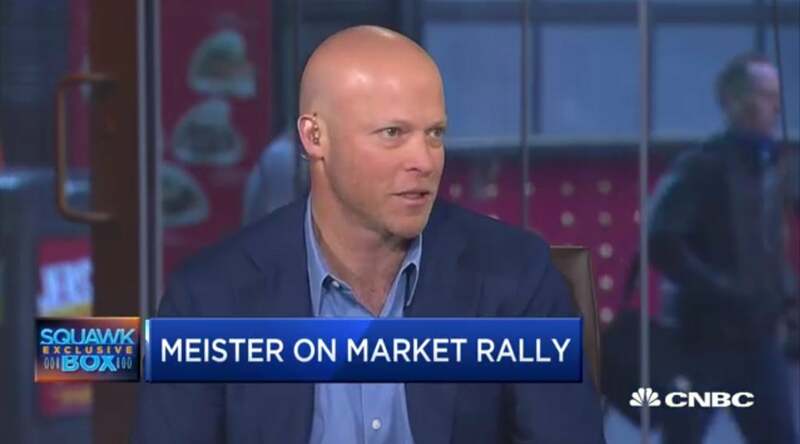 Hedge fund titan Keith Meister joins “Squawk Box” to discuss the market rally heading into the second quarter and what investors should think about for the rest of 2019. Let's talk about what happened in the first quarter pretty phenomenal performance of course it was coming off a very sharp downturn in December. But what do you think happens now. So I think your point is right. We have to set expectations of where we are starting from. I think you have the perfect storm in December. The combination of the market perception that the Fed was going to hike US into recession. So back in Q4 I think people were expecting five or six fed hikes between then and 2020. You had a trade war with China that was toxic. I was on this show on December 6. I think that was the day that the CFO of Huawei was arrested. Today we have a PMI number out of China above 50. So a lot's changed. Views of China and as a result of the combination of the Fed and China market sentiment was awful. The capital markets were closed. Many investment managers were directing or selling ahead of redemptions as a result the market sold off 20 percent in Q4. So things are usually not as good as they seem or usually not as bad as they seem. So what does that mean if we overshot to the downside there. Have we overshot the upside or are we just getting back to where we should be. My personal opinion is we're probably back to what is a relatively fairly valued market. There was a major pivot which can't be underestimated which is we went from having five or six rate hikes estimated to today I think one and the rhetoric would imply maybe we cut before we raise. So the 10 year tenure was you know 320 go into Q4 which caused all this. Now we have a 240 tenure S&P earnings estimates for 2020 haven't changed much. Maybe they went from 185 to 180. So the actual spread between the S&P earnings yield and the risk free rate or the 10 year rate is pretty wide today. So it seemed to me the market's. Relatively fairly valued and if you just look at a screen and went on a boat for the last five or six months things are flat. Earnings have grown. The Fed is a little more accommodative. So you know equities probably feel a little bit better today than they did at the end of Q3 but with that said it's been a big run over the last three months. But the markets are the highest they've ever been on an April Fools Day right now. So things are clearly pretty pretty good. If you come back three months from now like you were here in December and things have gone completely pear shaped what is it that went wrong. It's a great question and I think it's something either geopolitical or some unknown. I don't think it's going to be from multiple. So what's going to cause the earnings not to be what's causing earnings not to show up. What is that unknown unknown. If nothing else shows up. I think the PlayBook we have is a lot of what we've had for the last several years which is that the overall economy is growing at a tepid rate. The U.S. is the best house in a bad neighborhood but U.S. businesses deserve credit because they're driving more earnings. I mean over the last 10 years we've had a slow GDP recovery. You know maybe it's been 2 percent GDP but S&P 500 earnings have doubled. So we've had you know 7 percent per annum S&P earnings growth plus a 2 percent plus dividend. Businesses deserve credit for for for driving productivity and driving pretty profits and I think a lot of it happens because one and no one comes on this network and celebrates America American capital markets are the best in the world. American businesses aren't perfect. They're better today than they've ever been. They're better corporate governance. There's more accountability. And businesses are able to leverage scale to invest in technology and to drive profitability and that's driving corporate earnings for activist investors. Given that you just said there's more accountability and better governance. How much harder is it today to find a fat and happy company to go after and more competition never. So if that's the narrative it's a lot harder. But I don't think that's the narrative. I think the narrative is I think it's a great conversation. The narrative is shareholders are owners of companies. Sometimes companies do things you don't want them to do or could do better things. You have a voice use your voice so it's a very it's a very populous almost progressive kind of movement that once it starts it doesn't stop and it may have started with a bunch of hedge funds or you know well the fact that you're hearing it from the black rocks of the world 100 percent is like the biggest event to me in Q1 was Wellington coming out against Bristol-Myers LG. So think about what that was very well regarded traditional passive long lonely saying I own the stock. Bristol-Myers I wish the company were sold or I wish the company continue to invest in R and D and not by Celgene. I can vote for this deal or I can vote against it and the reality is they realize if they don't speak up they go away and they get replaced by BlackRock. Right. So Wellington has to justify its fee for active ownership over BlackRock and if you own healthcare stocks and you think Bristol-Myers is doing a bad deal speak your mind. Now. I happen to be on their side that investment. I bought some Celgene I won the deal to close a Wellingtons doing is great for the capital markets. Now there may be unintended consequences. Right. The next CEO thinks about doing a deal may make sure he or her has his shareholders on sides and it may in fact make doing transactions harder. But in general it used to be taboo for Wellington to speak their mind. Now they have to announce the only way they're going to outperform BlackRock. You have a take on the IPO market specifically I'm thinking about lift on Friday and what that may mean or not for the rest of the Unicorn's or dakka Korn's. Well first thing is it's it's I don't know if it's a bullish or bearish sign for overall valuations but it clearly says markets are open. Remember in Q4 we didn't even have a high yield bond deal. Right. So the market plunge allows the IPO market's much healthier. I think the most interesting thing to me though is all the companies that are coming public have one thing in common they're tech businesses. So there's a huge changing makeup of what is a good point. So Buffett for the most part tech businesses there a change in the makeup of what the market's going to be. So as we look forward right the components of the market will be more driven and make sense by technology. By that do you buy left. You know we did buy a little bit of how to do value lift. How do you value a business that has it's losing a billion and it's going to be losing a billion for a long time. What were in your model did you get a return on cash. So are you know investing is it sometimes valuation sometimes as capital flows are left investment was a capital flow around sort of you know if you get allocation IPO and you can pick up you know. So some stuff as well. Yes. So you bought us. So just overall back to the macro. So definitely the regulatory environment is more positive in this country tax for businesses tax environment definitely more part positive. Wage gains at the low end. You're starting to see because of the tight employment picture. I mean the reason you have trouble. Answering how we're going to be datastream months is because this makes me nervous but I don't. Everything seems more positive right now. There were 16 times earnings. So I don't I have trouble with the bear case as well suits suit so I disagree what you say I agree with what you say and there are real winners and what you say and there are losers meeting a business that doesn't have pricing power that has labor costs that has to pass on raw materials. You know they may not be as well positioned but the consumer might be in better shape as an offset to that. We're going to you know we're going to get when I think you we're going to get to Cramer and we have been talking at least we were. No they just change that what happened to Cramer. I don't know if I was wearing it to carry it or because I'm talking about people who've been too negative. I mean there have been reasons to be positive. For the past couple of months just with the overall back. And then we get the China News today. Maybe even that bogeyman was not as scary as we thought. Right. I mean that's all correct.